BETTENDORF, Iowa - Mitt Romney bounded into the battleground state of Iowa today, aided by a new, non-partisan government report that painted a grim picture of the state of the economy, using the new data to return his campaign's narrative to his favorite catch phrase: the Obama economy isn't working. For Romney, it's just the topic he'd hoped to return to following days that have been focused on contentious comments by Rep. Todd Akin, R-Mo., about abortion that have forced Romney and his running mate, Paul Ryan, to step into the fray and comment on the controversy. The government report, released today by the Congressional Budget Office, estimated a $1.1 trillion deficit for 2012, and said that if the tax and spending cuts go through as planned in January that "such fiscal tightening will lead to economic conditions in 2013 that will probably be considered a recession." The report also predicted that the country's unemployment rate would remain above 8 percent for the rest of the year. "President Obama, bless his heart, has tried to substitute government for free people and it has not worked and it'll never work," said Romney, who spoke at an aluminum casting manufacturer in eastern Iowa, his second trip to the state this month. 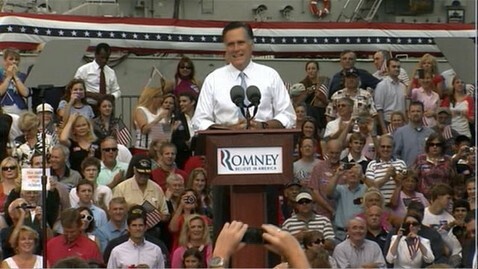 "I mentioned he said he'd cut the deficit in half; he doubled it," Romney said. "He said he'd get people good jobs. Instead, we've gone 42 straight months with unemployment over 8 percent, 23 million Americans out of work or stopped looking for work. It's inexcusable." Romney did not mention the latest government report by name. "You look at all of the debt of the country: why, it's about the size of our entire economy," said Romney. Earlier today, the White House put out a statement on the report, pointing the blame back on the Republicans. "Today's Congressional Budget Office report only reinforces the urgent need for House Republicans to follow the Senate's lead and pass a bill that gives middle class families the confidence that they won't see their taxes go up at the beginning of next year," wrote White House press secretary Jay Carney. "But instead of doing the right thing, Republicans in Washington have chosen to double down on the same failed policies that led to the economic crisis in the first place. They're willing to hold the middle class hostage unless we also give massive new tax cuts to millionaires and billionaires - tax cuts we can't afford that would do nothing to strengthen the economy."